The smell of slow roasting tomatoes wafting through the house is reason enough to make this Roasted Tomato Sauce. The second reason to make it (not that you need one) is that after making your own tomato sauce, it is almost impossible to go back to eating the overly sweet and processed store bought version. Growing up in an Italian household, the only tomato sauce I ever knew was the cooked preserved tomato passata used in pasta dishes and on pizzas. Being born in Australia however, it was only a matter of time before I had a sleep over at a friends house where Australian tomato sauce was involved. I managed to avoid it for some time when offered as a condiment. What was this tomato demon that was splotched on the plate beside my fish fingers and nuggets? Fast forward to present day and I’m all over a snag in a piece of white bread with cooked onions and a large dollop of tomato sauce just as much as the next Australian. The other day I saw this Roasted Tomato Sauce being made on River Cottage and knew that I just had to give it a go. I have always wanted to try and make my own tomato sauce so I adapted the recipe slightly by roasting the tomatoes with smoked sea salt and chilli olive oil. The sauce was so flavourful and surprisingly versatile that I’ve already found so many excuses to use it. In fact, it was all gone in a week – methinks I’ll have to try a double batch next time. 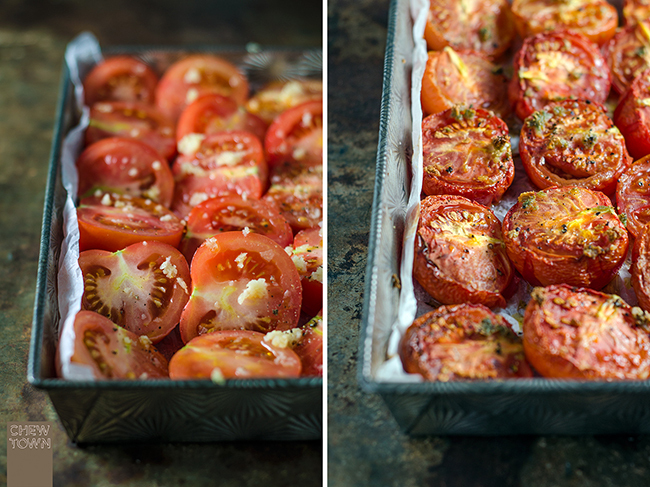 Cut tomatoes in half and lay them in a single layer on a large baking tray, cut side up. Scatter over the crushed garlic and chilli olive oil, and season with the smoke sea salt flakes. Place in the oven and roast for 60 minutes until the tomatoes are soft and starting to colour. Transfer the tomatoes to a large muslin lined sieve over a bowl and rub with a wooden spoon to extract as much puree as possible. Gather together the edges of the muslin and squeeze tightly to release the last of the puree. Then discard the pulp. Place the puree in a medium saucepan with the bay leaf, dark brown sugar and cider vinegar. Bring to a simmer over medium low heat and cook until the puree has reduced by half and has the consistency of a thick glossy sauce. Season to taste. Serve with baked eggs for breakfast, on top of grilled fish, or as a pizza base. Yum! Love all kinds of tomatoes! Fabulous recipe Amanda! Just you wait Helen… in February I’m going back to Perth for Italian sauce day! Can’t wait. I don’t understand why there’s so much sugar in store-bought tomato sauce. This one couldn’t be simpler! I love roasted tomatoes! You get such nice concentrated flavor that way. This looks wonderful — thanks. How long would this store for? Hi Sam, it should last for 5-7 days in the fridge. This is absolutely AMAZING, Amanda!! I really love how you showed us, once again, that everything is always, ALWAYS better when it is homemade. I’ve just bookmarked this recipe to give this a go — cannot wait! I’m sure I’m going to enjoy this very much, I have to have some form of sauce with everything. Again with the lovely comments Winston! You are such a sweetheart. Love slow roasted tomatoes, making them into a sauce is just simply a wonderful idea. Could you use the whole tomato and process into a puree and then continue? I’d hate to see it all go to waste! I don’t have a compost as I live in a flat. Hi Courtney, you definitely could blitz it all in a food processor and use the whole lot. It will be a thicker sauce but would still be great!